I was too young to know about good days and bad days as I led my older cousin, Elayne, into my bedroom and pulled the toy box from under my brother’s crib. I grabbed my trophy toy and pumped it up and down, making the colorful top spin. Elayne yawned. I had given it my best shot, so I knew I didn’t have any good toys. Oops, my name was mud, just the most boring material anyone could think of. I shrugged and pushed the box, the source of my fading confidence, quickly out of sight and showed Elayne my favorite book, “The Little Engine That Could.” I thought that would surely please her, but mother called and our adventure was interrupted. We hurried to the kitchen, the embarkation point to the cars. It was the extended family outing with a long drive to Yellowstone. An unrealistic trip for so many little folk, but I always fell asleep in cars and didn’t notice. The next day, kids and adults traded cars. I didn't know why, but I found myself, the only one of my family, in the back seat of Uncle Paul’s brand new Chevrolet. I was a quiet little girl and in unknown territory. In those days, back seats were huge and my little legs and feet stuck straight out in front of me, sitting between two older boy cousins. The pressure began to build and maybe I could have relieved some of it by crying, but I didn’t, that came later. I sat very still, didn’t want to draw attention to myself, but eventually, I felt warm relief and when it turned cold, I cried and the whole caravan pulled over. Uncle Paul asked, “Why didn’t you tell me you needed to stop?” As my teary brown eyes looked up into his big, blue eyes, he stole a glance at the big wet spot in the middle of his brand new back seat. He never raised his voice or ever after reminded me of it, but I knew it didn't matter. Oops, my name was mud. Our first night in Yellowstone, I crawled into a sleeping bag next to my parents in a huge tent full of relatives and fell asleep. I awakened to a rush of anxious voices and lights flashing around the tent. Uncle Harold held a rifle and I thought maybe World War III had started. I didn’t know what was happening. The story came later. A big brown bear had shaken the car where the little boy cousins and my little brother were sleeping. The bear had eaten a huge metal tub of cookies and left a big dent in the bottom of the pan. I didn't get a single cookie before they were all gone. Mama tried to console me with, “It's okay.” As I look back, I don’t know how she knew that, and I can’t even imagine the fear those little guys felt as a monster in the dark shook them from sleep. But after the family posted a guard, we settled back down. My hair blew around my head like fine gold thread in the breeze and I had a chance to see close up just what mud looked like in a boiling mud pot. I didn’t know how it worked, but it looked like chocolate milk and made me thirsty. We hopped back into the cars and drove, then Cousins, Aunts, Uncles, Mom’s, Dad’s and babies all stood in a big open field waiting, for what I didn't know. I guessed it was a surprise. “Oh, it’s late,” someone said. “It’s not going to,” someone else said. And I began to worry about what we could do about it, if it didn't. 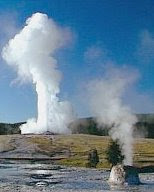 Then Old Faithful blew a spout of water so high into the sky, I didn't know if it would ever come back down. On the trip back home, I made sure I was safe in the back seat of my parents’ car, where nothing, nothing could go wrong. We stopped to let the bears cross the road and I generously gave one of them my ice cream cone through the back window. A ranger came up and scolded my parents for letting their child feed the bears. Oops, my name was mud again. My intentions were good, but I was just naturally trouble. I sat on my mother’s lap in the front seat and fell asleep. That really was the best way to survive a long car trip when my name was mud and I was only four.